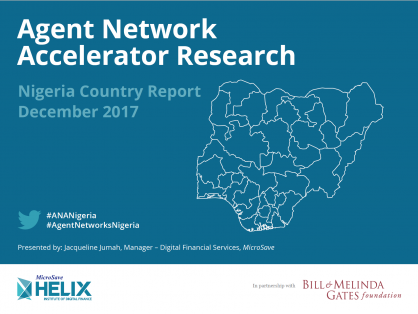 In 2014, MicroSave / the Helix Institute of Digital Finance, with the financial support of the Bill & Melinda Gates Foundation and the United Nations Capital Development Fund (UNCDF), launched the findings from the first wave of the Agent Network Accelerator Survey (ANA) Nigeria Country study. This report focused mainly on operational determinants of success in agent network management specifically agent network structure, agent viability, quality of provider support, provider compliance & risk. This research is part of the Agent Network Accelerator (ANA) a four-year research project implemented in eleven focus countries, managed and conducted by the Helix Institute of Digital Finance. It is the largest research initiative in the world on mobile money agent networks, designed to determine their success and scale. Nigeria is among the eleven African and Asian countries participating in this research project. The second wave of the ANA Nigeria study is focused on identifying strategic gaps and opportunities for scaling-up Digital Financial Services, with highlights on the implementation progress following the Helix Institute’s recommendations in the ANA Nigeria research conducted in 2014. Click the download button to read the full report.